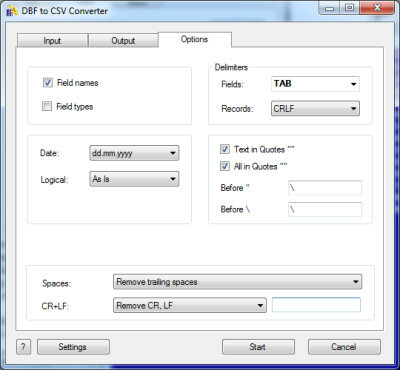 DBF to CSV Converter allows you to convert your dbf files to csv (comma-separated value) format. Generally, you can use any delimiter, such as TAB, semicolon etc. Besides, you can optionally conclude character fields in quotes, remove trailing spaces and select the output codepage. The program supports dBase III, dBase IV, FoxPro, VFP and dBase Level 7 formats.